Published on May 16, 2010 in COP, corruption, Elections, General T&T, NJAC, People's Partnership, PNM, Politics, Religion and UNC. 4 Comments Tags: Basdeo Panday, Patrick Manning, Politics, Selwyn Ryan, T&T Govt. This column has been witness to at least ten general elections over the past four decades. In almost all of them, the exceptions being those in 1976 and 1986, it has supported the PNM, whether implicitly or explicitly. We are now in 2010 and face many new and daunting political and economic challenges. After having thought carefully about all that has happened to us as people since the 2007 elections, and indeed before, and having also considered the issues and the options that are available to us in terms of leadership, I find that I cannot possibly support the PNM and have no alternative but to endorse the People’s Partnership coalition as the formation which best suits the political and economic circumstances in which we find ourselves at this juncture. It is time for a change. We need to open up the political system and consider other governance options. We also need to lay to rest the ghost of the NAR. And the fear of coalitions with which it left us. We are aware that the Prime Minster boasted to several individuals, including Caricom Heads of Government, that if he won the 2007 elections as convincingly as he expected to, there was no way he could ever be removed from office. Mr Manning was in fact articulating the ’Burnham Doctrine’, which states that if you are in power, and are prepared to do whatever is necessary to remain there, including using the state as a resource, you should have no difficulty ensuring this. Look at how I am quoting Colm Imbert now! But I have to admit that there is no better phrase to describe the rubbish being spouted by his political leader every day. And since one of Manning’s key faux pas recently was in referring to the incident where poor Colm blurted his “Rubbish! Absolute rubbish!” nonsense, it is fitting that I honour him this Sunday by quoting him. Martin Daly: Is Manning going back? The question ’is Manning going back’ refers to whether the current Prime Minister will succeed in winning another term in the general election, now one week away. 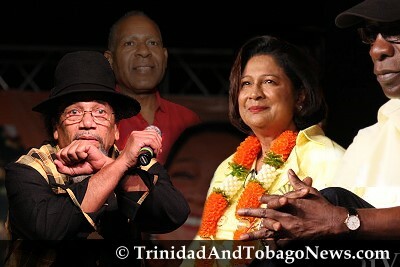 It is framed in the language of the Terri Lyons calypso supportive of Prime Minister Manning’s quest for another term. Dictator ? who said dictator ? He stops anyone he wants from entering TnT! He dislikes the Oval people – no cricket anywhere near election ! Selected brown package for us in world cup. Take down opposition billboards. Is that why Manning is being called “little Chavez” in world news ? HEAD IN A BLACK PLASTIC BAG AND HANG IT. PM WILL BE GONE BY MAY 24TH. THERE IS NOTTHING TO GAIN FROM THE PROJECT MANAGER EXCEPT PAIN. My o my , here goes Monique the delusional, simply unable to appreciate the meaning of the word endorsement in political terms. Please note for the record, that a vote against Patrick Manning , is not necessarily a vote against the PNM, or enthuastic support for Kamla and her party. The good Political Science Professor spent nearly half his life denouncing Basdeo Panday and his brand of neo -tribal , corrupt, and inept politics monique, and if Kamla slept in the same bed as her mentor Panday for close to 20 years, should he Dr Ryan vote for her come MAY 24th , it would be with two fingers pinching his nose to filter the air he has to breath, as he tries to keep the bile down in his stomach, while committing what to him would be such a ghastly act. Get real my lady , the minuet the PNM gets it act together, and put the final nail into the political coffin of their 65 year old leader-just like UNC did – Uncle Ryan would be right back where he belongs. Hopefully this fragile , politically motivated , hastily arranged marriage ,would be able to survive that long until President Max can unpack his household items from the removal vans from his dilapidated official residence , to some obscure hotel in central, so as to accommodate his successor Winston Dookeran, one week after election. What naive comedians indeed!You know what, since all dem pseudo intellectuals across our country , have collectively written so many unpalatable books on the subject, perhaps it’s time that yours truly , get down to business and pen a book on the machinations of political power, as played out in complex, interracial ,and tribal societies such as Sweet T&T , aka Rainbow Country , and the USA. Thanks for giving me a bestselling idea Monique. I take back all my unintended hash words.